Today I found out how fish gills work. These fantastic little organs allow the fish to absorb oxygen from the water and use it for energy. Functionally, gills are not that dissimilar to the lungs in humans and other mammals. The main difference is how they are able to absorb much smaller concentrations of available oxygen, while allowing the fish to maintain an appropriate level of Sodium Chloride (salt) in their bloodstream. Gills work on the same principle as lungs. In the lungs, there are small sacs called alveoli that are approximately 70% capillaries. These capillaries carry deoxygenated blood from the body. As oxygen and carbon dioxide pass across the alveoli’s membrane, the capillaries take the newly oxygenated blood back to the body. Similarly, gills have small rows and columns of specialized cells grouped together called the epithelium. Deoxygenated blood in the fish is supplied directly from the heart to the epithelium via arteries, and even yet smaller arterioles. As seawater is forced across the epithelium membranes, dissolved oxygen in the seawater is taken up by tiny blood vessels and veins, while the carbon dioxide is exchanged. Gills themselves have a car radiator-like appearance. Most fish have 4 gills on each side, consisting of a main bar-like structure that has numerous branches as that of a tree, and those branches consisting of even smaller branch-like structures. This arrangement of cells allows for a very large surface area when the gills are immersed in water. Functionally, the mechanism for pumping water over the radiator-like gills seems to vary depending on the species of fish. In general, this is achieved by the fish lowering the floor of the mouth and widening the outer skin flap that protects the gills, called the operculum. This increase in volume lowers the pressure within the mouth causing the water to rush in. As the fish raises the floor of their mouth, an inward fold of skin forms a valve of sorts which doesn’t allow water to rush out. 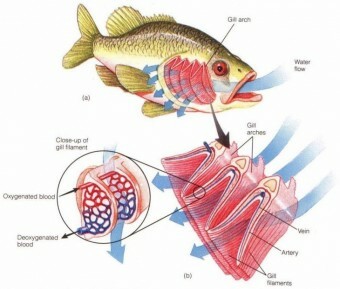 The pressure is then increased compared to the outside of the mouth and the water is forced through the operculum opening and across the gills. Gills themselves need a very large surface area to provide the fish with the necessary oxygen demands. Air is approximately 21% oxygen or about 210,000 parts per million. Water, on the other hand, only has about 4-8 parts per million of dissolved oxygen that the gills can extract. 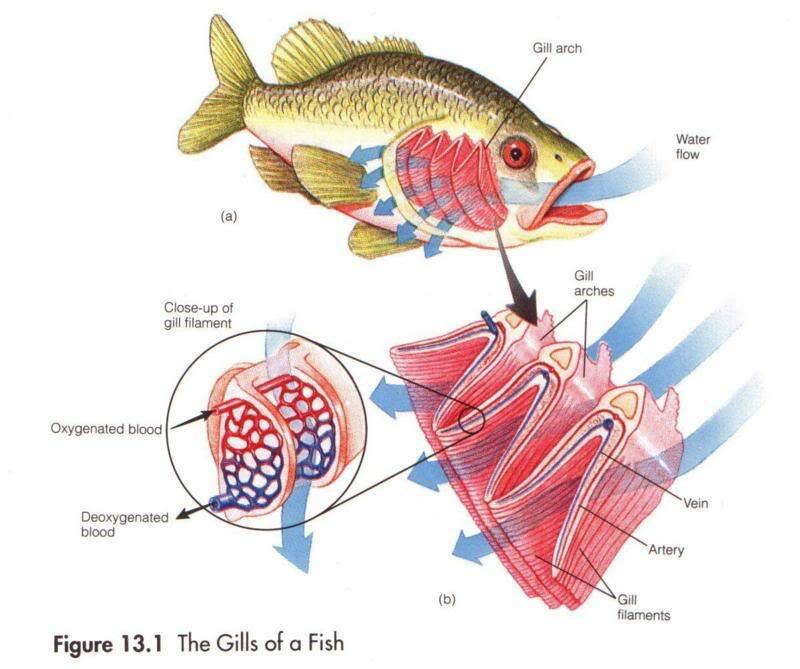 Because of this, if the fish did not have a large gill surface area to absorb as much oxygen as it can for it’s size, it would quickly suffocate. Cold blooded animals also tend to have a lower metabolism than their warm blooded counterparts. This aids them in their ability to handle environments of low available oxygen. Should the same size fish be warm blooded, the metabolism of the little swimmer would be increased to the point that the available oxygen would not be sufficient and little Nemo would perish. While the large gill surface area allows for sufficient exchange of carbon dioxide and oxygen, it at the same time exposes the same large blood volume to the hypertonic (that is, saltier than thou) sea water, creating a situation in which fish must have a backup mechanism for expelling excess sodium that has been incidentally absorbed. Conversely, freshwater fish need to have an opposite mechanism allowing them to excrete excess water to keep their sodium levels appropriately high. Never mind about those anadromous gypsies who trounce back and forth, able to thrive in both fresh and salt water environments. We will just call them show offs and leave it at that. To deal with this sodium problem, inside the gill resides nifty little cells called chloride cells. These cells allow for the extrusion of any unwanted sodium. Freshwater fish tend to have less of these cells than do their seafaring counterparts. This, combined with the ability to have extremely diluted urine, allows fresh water fish to keep their sodium level appropriately high. Given that the size of the gills helps with the uptake of oxygen, as you might expect, the more active a fish is, the bigger the gills compared to their body size. 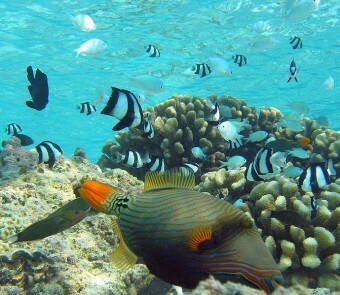 Because the marine environment is hyperosmotic, boney fish tend to lose water through osmosis. Because of this. they tend to compensate by taking in water through the gut, thereby exacerbating the problem of sodium uptake. The distance between the blood and water in the epithelial cells of fish is approximately 1 micro meter, or about 1 millionth of a meter. At approximately 32,000 species, fish exhibit greater species diversity then any other class of vertebrates. Fossil evidence has suggested that fish have been on the earth for approximately 400 million years. Fish that have the ability to live in both salt water and fresh water are called Anadromous fish. Most boney fish maintain the sodium content of their body fluids at approximately 40% that of sea water. Anadromous fish must have physiological processes to deal with the changing salt content in their environment. One mechanism used is that, while in fresh water, they tend to have the ability to excrete very dilute urine, thus removing more fresh water and keeping their sodium levels normal. While in salt water, they use a specialized group of salt excreting cells in the gills and mouth lining. They also have kidneys that can excrete very concentrated urine. Sharks and Hagfish have a much greater salt content than bony fish and it is naturally in balance with ocean water, thus not having the bony fishes problem of salt regulation. AN EXCELLENT INFORMATIVE WRITE. TNX. The fish pictured in the article intro kinda looks like Homer Simpson. Just sayin’. Typo in Bonus Facts #2, #8 and #10: “boney” should be “bony”. It is spelled correctly in the last part of the sentence in Bonus Fact #10, but incorrectly in the first part of the sentence.